Go on, say it with me.."Lardy Latte"...get it? This is a post that I will likely create some enemies over..that's right. 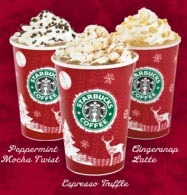 I am going to Menu De-Construct...STARBUCKS!! Noooo!!! I am just like the rest of you, and sometimes (if not all of the time) I need a morning pick-me-up. But this post has good intentions. Many people do not think of drinks as calories, and in turn, gain a TON of weight just from liquids. So..get ready to be upset, because those peppermint mocha and pumpkin lattes have to go...here is why...(Note...these calories are all listed with the "tall" option..i.e.- the smallest cup). 1. Any of the Hot Chocolates. Range from 230-310 (White Hot Chocolate) calories! What?! 2. Jingle Bells..Batman smells...Robin layed a Eggnog Latte at 460 CALORIES!!! No no no...and No. 3. ooo..you know what? All of the lattes run between about 200-300 calories..so let's just drop those all together. I will give you better options later on. 4. The Frappuccinos. It may sound cool to say it..but its definitely not cool when they add a whopping 300-500 calories onto your belly. Gross. "Skinny" or "Light" anything is much much better than its fatty counterpart. A Carmel Brulee Light Frappuccino runs 180 cal while the normal version runs 300. 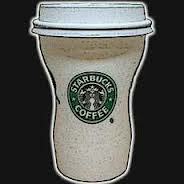 A skinny latte runs 180 calories while the other is over 300. Other tips: ALWAYS ask for skim milk and sugar-free syrups if they have them. This alone will slash about 100 calories. Also, try and skip the whipped cream! And as always...you guys know by now my favorite drink from our favorite coffee chain- Hot Green Tea!! 0 calories...and a plain old cup of regular coffee- 5 calories! So, should we stop having our daily Joe? Of course not!! Just make some wiser options!